Jerez de la Frontera was one of the “Frontier” towns between areas ruled by the Moorish Caliphs and by the Christian Monarchs. “De la Frontera” (on the border) was attached to many of the town names who existed on this fuzzy border, including Chiclana, Arcos, Conil, and Vejer. Jerez was reconquered from the Moors by Fernando III in 1251, only to be lost again, and on and on it went for centuries. Jerez is the capital of Sherry country. “Jerez” is actually “Sherry” mispronounced, centuries ago by British wine importers. It is home to many of the big names (González Byass, Emilio Lustau, Garvey, Emilio Hidalgo, John Harvey). The town has an aristocratic air, with wide avenues lined with palms, and many lovely squares. The two most interesting architectural monuments are the Cathedral of Salvador (boasting a masterpiece painting by Zurbarán, “The Sleeping Girl”, in the Sacristy) and the remains of an 11th-century Moorish fortress (called the Alcazaba, it contains a maintained mosque). Jerez came onto the world scene with the huge increase of demand for its local fortified wine, sherry. The story goes that Sir Francis Drake sacked the town of Cádiz, making off with barrel after barrel of the sweet tipple. England got a taste for the wine, including Shakespeare, one of Sherry’s biggest fans. Sherry has an ancient history, with a wine history dating back thousands of years to the Phoenicians. Even before Sir Francis Drake brought the wine back to England, other wineries had been making sherry commercially for centuries. The history of Valdespino winery in Jerez, for example, dates back to the year 1264 when the King of Spain granted one of his knights, Alonso Valdespino, 30 acres of vineyards. More than 700 years later Valdespino is still selling wine and is one of the oldest bodegas in the Sherry Region. Visiting the ancient bodegas (the wineries) is certainly a “must do” for wine lovers visiting Jerez de la Frontera. Sherry is quite obviously the most identifiable wine from the region. Made from Palomino grapes (along with Pedro Ximenez), sherry comes in a variety of styles. 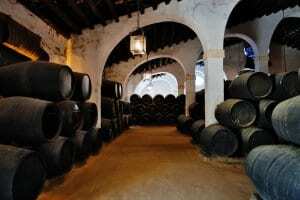 (Learn more about Sherry wine in the “Wine Regions” section of this website). It is considered by many to be the perfect aperitif and it is served in all of the bars with the “Tapas”, like olives, strong cheeses, “Chorizo” cured sausage slices, salted almonds. The “Gastronomia Gaditana” (meaning food from the region of Cadiz, to which Jerez belongs) is varied and delicious. 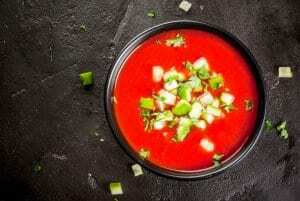 You will find freshly caught seafood (Flounder, Sea bass, Plaice, Mahi Mahi, Hake), and a variety of shellfish; Oxtail soup (made fresh after the bullfights), lovely cold soups (gazpacho, almond, Tomato with mint, pureed melon with bacon); Braised quail; tender beef and many more delicious, typical dishes including: “Langostinos al ajillo” (giant prawns in a garlic sauce), “Urta a la Roteña” (Perch sautéed with sherry, tomatoes and onions), and “Dorada a la sal” (Mahi Mahi cooked in a salt crust). Many of the historic bodegas in Jerez, in Sanlucar del Barrameda and El Puerto de Santa Maria (the Sherry Triangle), are open to the general public. González Byass is an exquisite winery, with an impressive dome designed by Gustav Eiffel (of the Eiffel Tower). Pedro Domecq is another exceptional winery with graceful arches resembling a mosque (and called “La Mezquita”), which was in fact inspired by Cordoba’s superb Mosque. On our wine tours guests receive special private tours with the winemakers (not tour guides) where we can taste “the really good stuff” (not on offer for the general tours), hear their stories and anecdotes and get a closer look at the passion and dedication behind the wine. The Royal Equestrian Academy, "Real Escuela de Arte Equestre"
This elegant 19th-century mansion, designed by the architect of the Opera House in Paris, is home to one of Spain’s most unique art forms, the “Dancing Horses”. Apart from scheduled shows (accompanied by flamenco dancers and guitar players), the training sessions are interesting as well. The show is called “Symphony on Horseback, an Equestrian ballet”. The Arabic baths date back to a time when Jerez was part of the Caliphate of Cordoba, under Moorish rule. The mosque in Cordoba (12 centuries old) was at one point the biggest in the Muslim world. Perhaps the most bizarre tourist attraction is the “Museo de Reloj”. It’s collection of over 300 clocks, many from the 16th-19th centuries, is one of the biggest in Europe. The museum is located in a palace, famous for its wandering peacocks. This 18th-century building houses a vast collection of historical musical instruments made for Andalusia’s unique performing art form, Flamenco.